Making your own healthy, yummy food has never been so easy. Advantages of making your own baby food. Disdvantages of making your own baby food. What if I don’t want to make my own food? Is a baby food maker really necessary? Our recommended baby food maker. I’m a huge fan of making your own baby food. More and more parents these days are making the decision to make their own baby food, and who can blame them? How do we know what exactly goes into the jars of baby food we buy from the store? Store-bought baby food can have a lot of added preservatives and sugars that you wouldn’t want your baby to ingest. If you want to make your own baby food — and know exactly what’s going into it — your best option is to get a baby food maker, which will allow you to make delicious baby food, as easy as can be! There are a number of different baby food makers out there, so choosing the best might be difficult. Here is a list of things to consider when you’re looking for a good baby food maker. There are a lot of great benefits to taking the time to research and find the perfect baby food maker. Not only do you get the benefit of knowing what’s in the food you’re feeding your baby, but there are a number of other great reasons to make your own baby food that you might not have considered. Saves money. Store-bought baby food can be expensive! Since the average American baby will consume around 600 jars of baby food, it’s easy to see how preparing your own food can save a lot of money. You know what you’re feeding your baby. Store-bought baby foods are chock full of preservatives and added sugars. Not to mention pesticides and other nasty chemicals. If you make your own baby food at home, you know exactly what you’re feeding your baby. Not only that, but you have all of the quality control: who knows what type of fruits and vegetables go into the pureed baby food you can buy at the store? You can even go completely organic if you want! Additional variety in food. If you buy jarred baby food at the store, you are limited to certain types of ingredients. If you make your own baby food, there is really no limit to what you can use! It’s important for people (especially children!) to have a well-balanced diet. You can even add your own choices of herbs and combinations to make great, delicious food that your baby will love. More nutritional value. 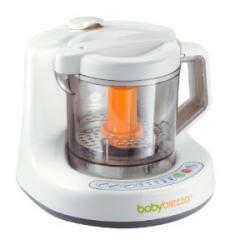 Some baby food maker models can steam the foods, which is a great way to keep all the valuable nutrients in it. The first few years of life are very important when it comes to growth and development, and having a balanced diet and all of the necessity vitamins and minerals is an essential part of it that a baby food maker will help with. It’s fresh. You can use 100% fresh ingredients at their peak ripeness – who doesn’t love that? Store-bought baby foods are cooked at an extreme heat during processing (to kill bacteria) and then sit on store shelves for months and months before consumption. Baby can eat the same food as the rest of the family. I love the fact that you can start baby off of the right path of eating the same food as the rest of the family. This can be a vital step in preventing them from becoming a picky eater. Disadvantages of making your own baby food. Of course, there are definite downsides to making all of your own baby food. It takes time. As a busy parent, it can sometimes be difficult to find the time to make tiny servings of food every day. It’s not as convenient, especially for travel. Prepacked baby food can be taken with you anywhere and doesn’t even need to be refrigerated. Of course, you can always bring your home-made food along with you, but it’s more of a pain. It needs to be refrigerated. Home-made foods spoil quickly and need to be put in the fridge or freezer. This takes up space and you have to go through the trouble of storing them away, too. It might taste gross. There’s a reason why many store-bought baby foods load them up with sugar. It’s very easy to make food that tastes bitter and gross, because the fruits and veggies weren’t ripe enough or because you did something wrong. Is it really necessary to make my own baby food? Many parents feed their little one with store-bought food, and truth be told, nothing horrible is going to happen if you do so. Likewise, you should never feel like a failure because you go store-bought instead of making your own. In fact, even parents who primarily feed their child with home-made baby food will supplement with store-bought food sometimes. Let’s face it: store-bought food is way more convenient. Of course, there are tons of benefits to making your own food, but if you make the choice to feed only store-bought food, that’s perfectly acceptable. Do I really need a baby food maker? If you’re set on making your own baby food, you absolutely don’t need to buy a specialized baby food maker if you already have a food processor at home. In fact, you can do everything 100% by hand and still make great home-made foods for your little one. Let’s be real: when it comes to all of the expenses you’ll need to look after for your new baby, a baby food maker is really a luxury and not at all a necessity. However, if you really want to feed primarily your own home-made purees, the convenience of an all-in-one baby food maker can’t be understated. Time is something that comes at a premium when you have a new baby around the house, and having the convenience of being able to throw the veggies into the machine along with a little bit of water, turn it on, and have the machine automatically make a ready-to-feed puree is almost magical. But if you just can’t find the room to squeeze a machine like this into your budget, it’s really not necessary. All-in-one machines vs. manual food mills. The main choice you need to make when choosing a baby food maker is whether to get an all-in-one machine that does everything for you or a manual mill that requires you to steam or roast the food yourself before pureeing it. These are a wonderful option for parents who want a hands-off approach to making their own baby food and want a machine that will do everything for them. There are pros and cons to an all-in-one machine, of course. No need to pre-cook the veggies. An all-in-one machine will handle that for you. All you need to do is wash and peel them, throw them in the machine along with some water, and before you know it, it will spit out a ready-to-feed puree. Way more convenient and saves time. Because you don’t need to pre-cook and prepare the veggies, you can save a lot of time. They tend to be bigger. Unfortunately, countertop space can often be hard to come by, and all-in-one machines are bigger than food-mills. Harder to clean up. Because there are more parts that come into contact with food, cleaning these machine can be a pain. More expensive. If your budget is already stretched thing, it might be hard to justify spending a lot of money on something that is more of a luxury than a necessity. Manual or electric? — Baby food makers come in both manual and electric versions, and the first thing you should think about is which type you’d prefer. Generally, electric models are much faster and efficient, not to mention easier to use. Manual baby food makers are usually less expensive, but take manual effort to use. I would recommend an electric baby food maker over a manual one. Dishwasher safe & easy to clean — Having a dishwasher-safe baby food maker can be very convenient. Some baby food makers have a lot of different parts that need to be washed, and being able to throw them in the dishwasher to clean can save a ton of time! You’ll probably want a baby food maker that is easy to wipe clean and doesn’t show smudges — chrome and stainless steel are notorious for this. Just something to keep in mind. BPA-Free — BPA stands for Bisphenol A, a compound used in plastic parts of many food storage containers. 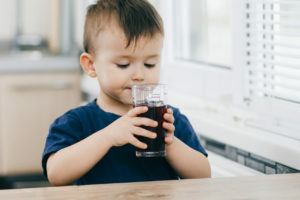 There has been a lot of controversy over BPA recently, leaving parents concerned that it might be harmful to their children. While there is no concrete proof that BPA is harmful to humans, you might want to go with a BPA-free baby food maker for some peace of mind. Made of unbreakable materials — Safety is very important, and I’d strongly suggest finding a model that contains 100% unbreakable materials. It would be extremely dangerous if part of the baby food maker were to break and end up in the food. Which type of baby food maker? — There are several different types of baby food makers that cover a wide variety of functions. Some models will do only the most basic preparation: blending or grinding the food which you then have to cook, and some baby food makers will do everything, including the cooking! An all-in-one unit might be a good option; not only are they convenient, but countertop space is a precious resource. Some other things you might want to think about when searching for a baby food maker are things like features and functionality. If you want to make large batches of baby food at once, you’ll need a large capacity baby food maker. Of course, these take up a considerable amount of space on your countertops. A steamer function is something that many parents find useful. Steaming foods, especially vegetables, is an excellent way to preserve the valuable nutrients found in the foods, and I would definitely encourage you to purchase a baby food maker with this capability. On top of helping preserve nutrients, steaming is also a great way to lock in the flavor, making great-tasting food for your baby, too! 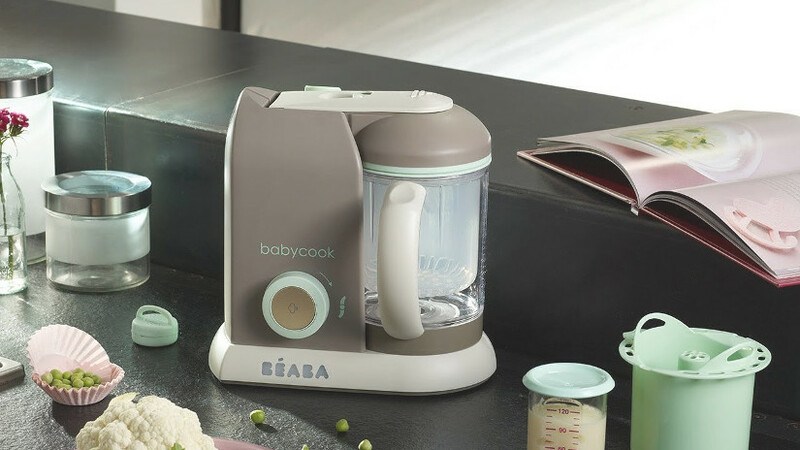 A baby food maker can be a wonderful addition to any kitchen, allowing you to make great, wholesome and organic food for your precious little one. I think that if you give one a chance, you’ll never go back to feeding your baby store-bought baby food again! Take the time to find the a great baby food maker and I promise you’ll love it. Of all of the all-in-one baby food mills out there, this is the one I’d recommend. It has a large capacity of 4.5 cups, which equates to roughly 18 servings. If you’re pressed for time like most parents, you’re going to love being able to make so much food at once. The Babycook does have a little brother that’s cheaper and has half the capacity, but I wouldn’t recommend it for this reason alone. However, I wouldn’t recommend filling it to the absolute brim when cooking. Instead, leaving some empty space to make sure the food is cooked at an even temperature all the way through is a better way to use it. The Babycook does have a little brother that’s cheaper and has half the capacity, but I wouldn’t recommend it for this reason alone. It has a relatively small footprint of 8.5″ x 4.2″ – it’s narrow, making it easy to fit on most countertops. The blender cup is made of food-grade plastic without BPA. I know, I’m not a fan of plastic either, but the main reason companies use plastic instead of glass in blenders is that glass can shatter from the high speed. The last thing you want is shards of glass in your baby food purees. The Babycook Pro is pretty easy to use. To start out with steaming, you add a tiny amount of water to the reservoir in the base of the machine. Then, you add your chopped up veggies to the steaming cup, which goes inside the main mixing cup. You place the mixing cup in the base, then press the steam button. An indicator lights up to tell you that the steaming process is still going on, and it turns off when it’s complete along with a beep. You remove the mixing cup, pour the steamed ingredients into the mixing cup, place it in the machine, and puree! It’s really easy, and it takes all of the guesswork out of making baby purees. The whole process takes about 15 minutes from beginning to end, although it might take a little while longer depending on how much you need to prepare your ingredients. Something nice about the Babycook is that once you make your purees, you can freeze them and then use the machine to defrost and warm them up again for you. Can you make meat purees? You can, yes! The main thing to remember is to always cut your meat into very small chunks to make sure it cooks all the way through in the mill. I’ve seen a few people say that they’ve had mold issues in the water reservoir with other models of the Babycook. As long as you let the reservoir air dry out (don’t close the lid up every time you clean it) it shouldn’t have any problems. If you’ve used a typical blender before, you’ll be happy to know that it’s a lot quieter than that. It’s relatively quiet during the steam function, but obviously the blending action is louder. Still, it’s not too bad. The blending cup, mixing cup, spatula and lid are all top-rack dishwasher safe, but to make the parts last as long as possible, washing by hand in warm soapy water is recommended. The blade can be disassembled from the machine, making it easy to clean and get out any chunks that might have gotten stuck underneath it. Can you blend to different consistencies? You can! However, there are no predetermined settings. You just blend it until the food reaches the consistency you’re aiming for. I personally recommend Amazon for most baby gear. The main reason is their excellent return policy: no questions asked for 30 days. So if you get the machine and you don’t like it, you can simply send it back for free for a full return. You can see it on Amazon by clicking here.